I have ordered your book; however, it has not arrived yet (it hasn't had time to get here). However, in the meantime, I have a question. Could you tell me how to make a stole protector? I made one years ago out of an antique hankie, but I cannot remember how it is attached to the stole in order to be laundered? A stole protector is a piece of white cotton fabric about 12 inches long and approximately four inches wide. Sew it onto the top of the neck back of the stole to keep the oils from the skin and hair from staining the stole. 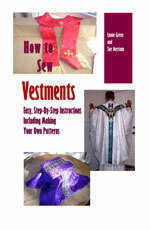 I usually sew this loosely on by hand, and then when it gets dirty, just take it off, wash it and sew it back on.